That was the best KL trip I have ever had. Arguably, we only stayed for a short period of time, however, we went to so many locations! Here is a countdown of places we went to, in chronological order. 2. The brand new Pavilion. A mall of brand names and indulgence! Kind of reminds me of Siam, in Bangkok. 5. Speaking of our Hotel, here it is, Hotel Agora. A little bit on the dingy side, but we’re not in the hotel much so everything worked out fine. Hehehe. We had many MaPY visitors ALL the time and the hotel manager must have had a headache. 😛 Oh and we really love the strategic location. 6. In the Kemensah area, a few minutes drive from Bukit Bintang, and justttt behind Zoo Negara, we had supper at the Chalet Rimba Jinbara! Hahaha. This was actually managed and run by the famous Malaysian rock band, Jinbara. 7. Malaysia’s premium tourist destination, KLCC! Of course we went there man! We went there for shopping in Suria KLCC. 10. But after all the calories I burnt, I became instantly fat again because our next location was Sate Kajang in Melati Square! How come their satay is so fat? 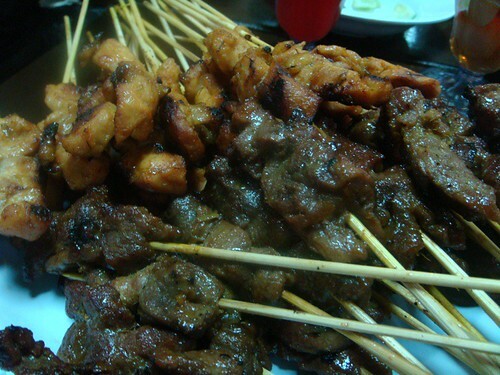 Our Bruneian satays are all so malnourished in comparison, yet we’re fatter. Haha. 12. Hungry after that? Not really, but we went to eat anyway in Kampung Baru. 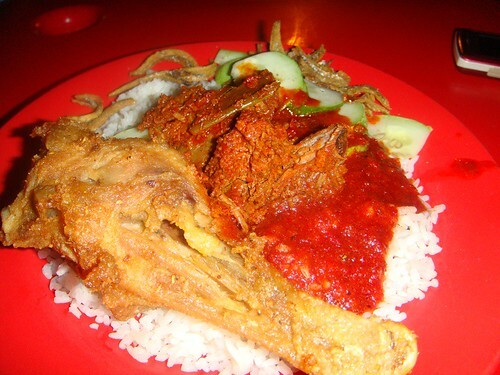 We didn’t just eat regular things, we ate the famous Nasi Lemak Antarabangsa. 13. Next day we woke up really late and had lunch straightaway. Hehe.So our next location was, Nasi Kandar Pelita! Reportedly owned by Pak Lah? Oh who cares, it was nyummy. 14. We went to One Utama (sister of our nearby One Borneo). We ate a lot here too. I was probably eating a pretzel or a bagel of some sort right there. 15. IKEA! Hahahaha. Not for furniture shopping (although I really love a pink drawer I saw there) but for a photo session!!!! 16. Right next to the Ikea building is The Curve. Hehe. Met our friend there. 😉 Here is Faizal Tahir, who just came out of a press conference. 17. Petronas… filling station, not the twin tower. First time filling up gas for a car! Yes, I was singing Siti. 19. Did a little shopping in Mid Valley. Yes we always start our day with shopping. Hehe. 20. Now here is where it start to get interesting. Next location was… Pantai Indah, Jeram, Selangor! We were probably the first Bruneians ever to go there. 21. Ate yummy seafood in Aroma Ikan Bakar, nearby Pantai Indah. All the seafood caught daily. 22.Pretended to be factory workers in a Factory that assembles surgical caps, also in Jeram. Yes it was already almost 9pm. Time flies so fast! 24. Camera battery died, and we actually went to another place to eat Chee Chong Fun. Yummy! Will try to remember what the place is called. You know the place is really good when the locals line up for a long time to get their order. 25. Next day! Sunway Pyramid! 26. Had Nasi Ayam at the reportedly best Nasi Ayam place in Bukit Bintang. Oh and we met our friend here. 😉 Ezad Exists! Third celebrity we met. 28. Dataran Merdeka (wooo, we have assimilated into the Mat Rempit culture LOL). I’ve been wanting to go here eversince we came because this is where all the rempit takes place. Hehe. By the way, rempit is my new favorite word. Apparently stands for…. Remaja Enggan Mematuhi Peraturan… IT. Hahaha, isn’t that whimsical? For those who wonders, yes the clock at Sultan Abdul Samad Building works. We came at 2.15 and we were wondering if it works, so we waited till 3am. IT DOES! Struck 3 times at 3am. 29. On the day we left, we woke up extra early, and showered extra early. Because we were on a mission. To get to the KLCC twin tower bridge no matter what! 30. Our last location of the trip: KLIA. Very interesting accounts of your visit. I also visited your country long time ago…. it was not bad either… unique in her own ways. Thanks I had a great time there! 😀 Will see KL again soon! Hehehe. Nice blog….Beautiful pics…Great trip, story, and especially photos! Thanks for taking the time to share.